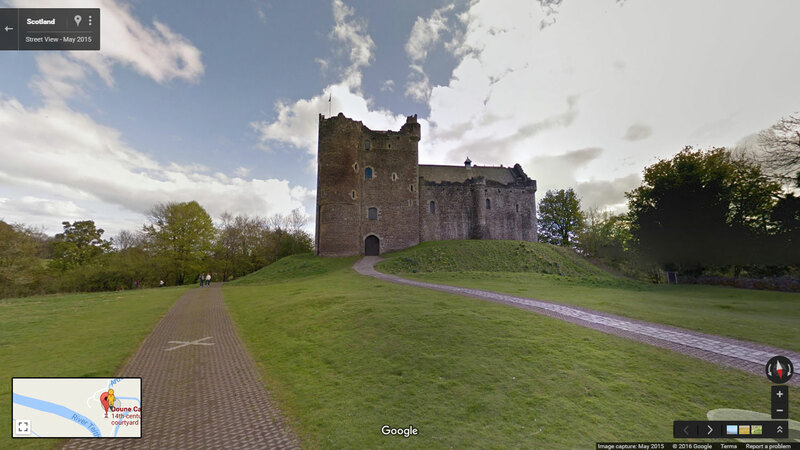 Appearing in many season 1 episodes of Outlander, Doune Castle is used as Castle Leoch, the seat of Clan Mackenzie. It is here that we are introduced to many important characters, including Murtagh, Mrs Fitz and Laoghaire MacKenzie as well as Colum MacKenzie, Laird of the Clan, his wife Letitia and their son Hamish. Much of the castle was used in filming. The huge courtyard, and great hall were used to great effect, as well as the surrounding grounds. One interesting exception was the Doune Castle kitchen. A set was built to exactly replicate the castle’s kitchen, presumably to help make filming easier. Originally built in the 13th century, Doune Castle suffered much damage in the Wars of Independence. It was later rebuilt in its current form in the 14th century. Also well known for its use in Monty Python and the Holy Grail, and now Outlander, it attracts many visitors. 1 April to 30 September : Monday to Sunday, 9.30 a.m. to 5.30 p.m.
1 October to 31 March : Monday to Sunday, 10 a.m. to 4 p.m.